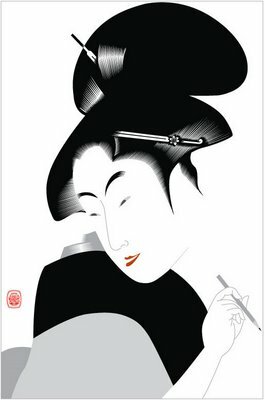 Continuing work on the Utamaro inspired illustrator in SF. Like what's happening. Sent a note off to CF Payne about the portrait project to get some guidance and thought. It dawned on me that the Jean Tuttle/ Nancy Stahl project was boring me to death...not jazzy enough so maybe I will do a portrait of Diana Ross (from Connecticut) and push it a bit a la Risko/ and the South American Pablo Lobato. Feeling better about this. Boredom really sticks you in neutral. I am fiddling with our little dharma pal. funnzies. Not much to look at yet. Cooked down a mess of chicken bones from my new favorite from the grocery store, antibiotic free, natural chickens (rotisserie style) without the terrible quicky mart seasoning and stink. Its quite delicious and it is prime for making this great new thai chicken salad that the home team have been loving (even demanding!) in this month's Martha Stewart Good Eats magazine (the small magazine at the grocery store). One of my favorite magazines cause the recipes are dumb, quick and delicious... Back to the bones, I made wonderful stock from these bones before (the best this year), so I am def. in the recycling mode with these small chickens. This robust stock may come from a robust quantity of bones. So, remind me, but next winter I am for certain going to buy the box of backs and bones they sell for $10. at the Regional Access. The Van Engelen catalog came yesterday. With this cool humid weather, it is obvious to think about piles of bulbs--affordable piles of bulbs, more more and more. They had 250 daffodils for $74, all excellent quality, with a ton of choices from iris, peonies, frittilaria, allium. You hear me talking about these things...This is the place to buy them. Paired with teen labor...1000 daffs are going in this fall. More frittilaria maximus and allium gigantium. Do you see a trend? Maximus and Gigantium.